I wanted these Valentines to be easy to make, so I knew I didn’t want to do any cutting. My son is still not adept with scissors so I looked around for something precut and voilà! Index cards. They are sturdy, the right size, and a nice blank slate. I prepared three heart stamps by gluing hearts cut from cardboard or foam to a cork and bottle caps. I wasn’t sure what was going to work best so I mixed it up. I wasn’t too concerned with creating perfect heart stamps. I knew the paint would get messy and blurry anyway. I just wanted a simple way to make Valentines. 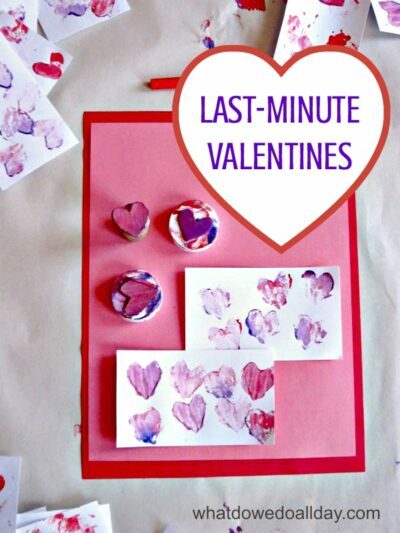 People are always forgiving when it comes to kid-made cards! Plus, as you know, I’ve very relaxed when it comes to arts and crafts activities. 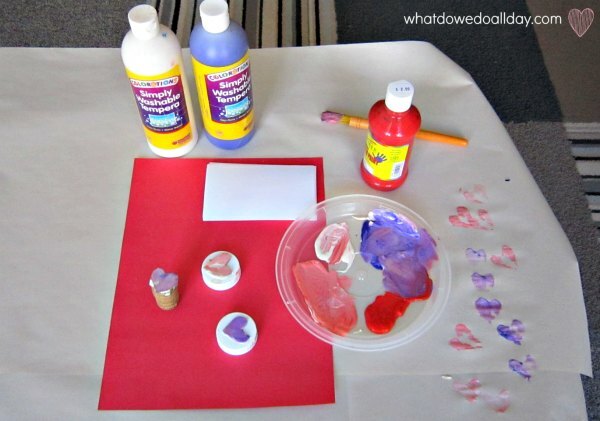 I squirted red, white, and purple (you know, “valentine” colors) on a shallow dish. I used the brush to spread it thinly so it wouldn’t be too globby. 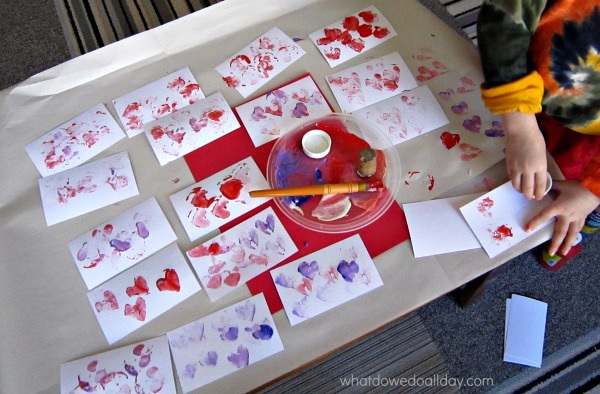 New Kid dipped the homemade heart stamps in the paint and stamped away. He felt a bit daunted by doing all 24 cards at once, so I helped him out. It’s nice to be able to do projects like this together. He was home sick from school (but not too sick, obviously) so we were able to do it without his older brother. These valentines are not as quick from start to finish as last year’s since you do have to wait for the paint to dry before writing on them. 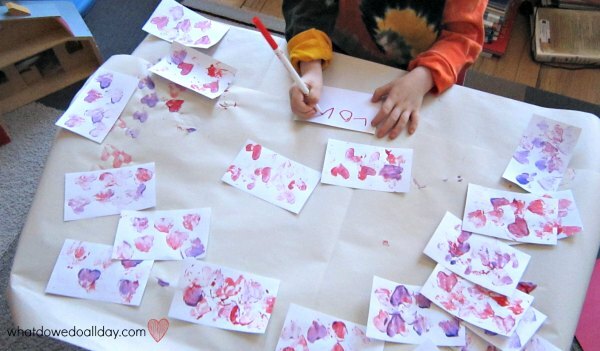 The teachers prefer that the other kids’ names not be placed on the Valentines since it saves sorting time during delivery so New Kid just wrote “Love” and his name on the back. They are not picture perfect or exceedingly clever, but they are homemade and New Kid will be proud to drop them in all his friends’ Valentine mail boxes. 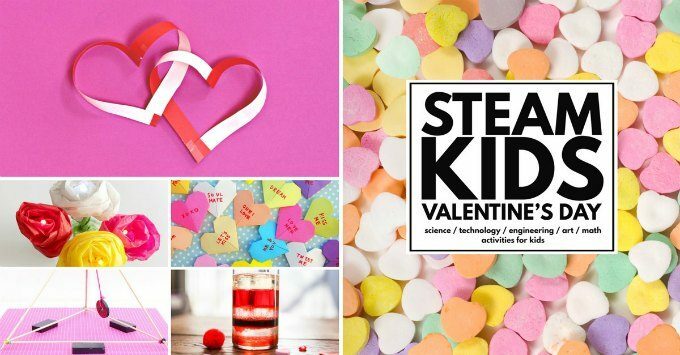 When you are looking for a unique way to celebrate Valentine’s Day at home or in the classroom with a special project, this is the perfect resource: STEAM Kids Valentine’s Day Projects!